The latest bird flu outbreak in South Korea is presumed to be a new type of avian influenza strain that is a reassortment of highly pathogenic strains that spread in Europe last year, the quarantine authority said Monday. 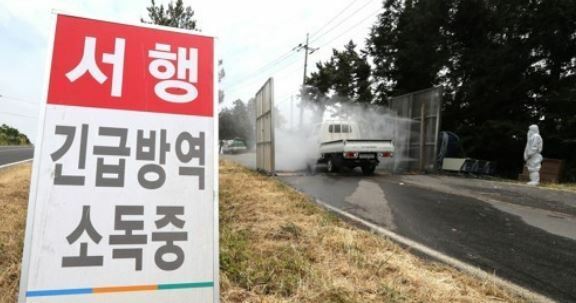 The Animal and Plant Quarantine Agency said its interim inspection into the bird flu case in Jeolla Province on Nov. 17 may have been transmitted from migratory wild birds that have flocked to the nation since October. "A new strain generated by virus reassortment is presumed to have entered the nation since October via winter migratory birds," the APQA said in a briefing. "A joint investigation team has been analyzing viruses separated from 852 corpses and droppings of wild birds to figure out the cause of the outbreak and trace its origin." H5N8 that spread in Europe in late 2016 and a low pathogenic H3N6 virus found in European wild birds, the APQA agency said. Its genomic sequences showed different patterns from the strains widely discovered in the nation last year and cases detected earlier this year, it noted.